with all the relevant details, together with photographs (if applicable). Photographs of the local area or events are especially welcome. 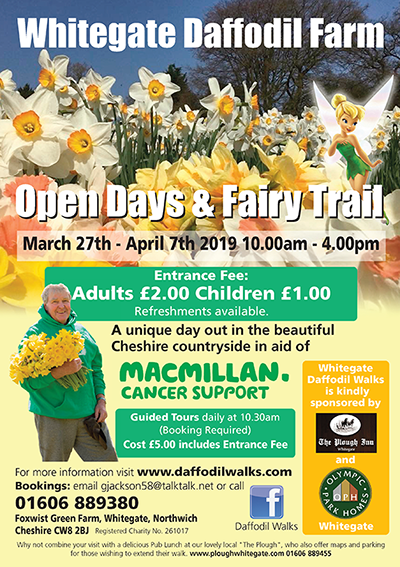 Walks this year will be daily from 27th March to 7th April inclusive, with tours each day at 10:30am (Booking Required / costs £5.00 includes Entrance Fee), and walks at any time from 10am to 3pm. For more details see the booking page. Entrance Fee: Adults £2.00 Children £1.00 (Refeshments available). Groups of locals are walking the Sandstone Trail in Spring to raise funds for The Kelsall Wellbeing Hub. This facility will benefit people of all ages in Kelsall and other communities. One group is walking the full 34 miles over 3-consecutive days on 29/30/31 March. This is quite a demanding schedule and only a few positions remain open. However other smaller groups are doing part or all the walk over a period to suit their schedules and /or abilities. This is arguably the best walk in Cheshire and it’s on our doorstep. Why not walk a section of the trail with family and/or friends and help to raise funds for a valuable local asset? Do as little or as much as you want any time from March to May. Download the FREE WALKERS GUIDE. With Spring just around the corner, Bank and School Holidays aplenty, what better way to exercise, see great views and make a big contribution to your local community. GO FOR IT! To get your sponsorship forms and details of how to deposit funds see the Kelsall Patient Participation Group site at https://www.kelsallppg.com. Alternatively, email: Philpearson7@gmail.com for more information. Admission: Adults: £5.00 Enquiries: 01829 752931. Pay on the door only. Doors open at 7.00pm. Refreshments available. This is a foot-stomping celebration of Queen and lead singer Freddie Mercury, tracing the band’s meteoric rise. They reach unparalleled success but Freddie shuns Queen in pursuit of his solo career, only to reunite with his bandmates just in time for Live Aid. Facing a recent AIDS diagnosis, Freddie leads the band in one of the greatest performances in the history of rock music. Kelsall Garden Club Plant Sale will take place on Saturday, 18th May on Kelsall Green from 9.30 to 11.30. Plants for sale are all grown by club members and monies raised go towards the club and its activities. So if you have any gaps in your borders or your veg plot then come along and get something that is really "homegrown". A full Spring Bank Holiday weekend of live music, comedy and dance in Kelsall. Full details available here: Chester Folk Festival 2019. 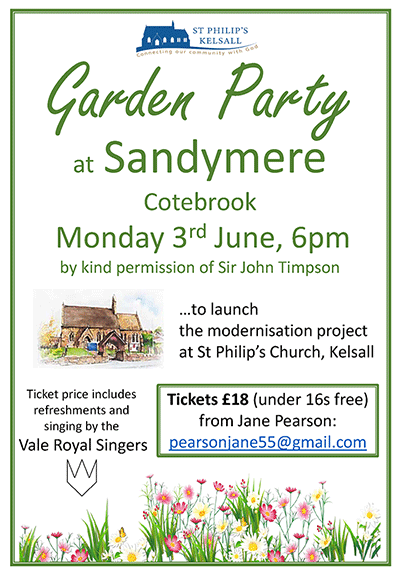 Ticket price includes refreshments and singing by the Vale Royal Singers. At the time of writing we have passed £93,000 towards the £115,000 we need to be in a position to place the construction order to build the Hub. Our aim is to reach this total by the end of April as we expect to have to give the order to proceed in May. We are very sure that there are numerous people who intend to make a donation or buy a bond but haven’t got round to it yet, so it is important that they act now. There’s only 6 weeks to go! You can get an update on the fundraising at www.kelsallppg.com. There has been a healthy discussion going on in the village about the need for the Hub and the benefits that will flow from it, so it is just worth going over this ground again. The primary focus of the Hub will be loneliness and social isolation. If you read the government’s loneliness strategy you will see that loneliness is a bigger killer than alcohol, tobacco and obesity. A study carried out by University College London concluded that limited contact with family, friends and community groups predicts illness and earlier death. Another study concluded that social contact is the biggest factor in longevity, particularly face to face contact. The fact is that people get ill and die prematurely from social isolation and we have people in our community who are lonely or socially isolated. The Hub will be there for those people and in this way we shall help those people to live longer, healthier lives. However, this is not the only focus. We also want the Hub to provide support for people who are struggling to deal with a wide range of things such as bereavement, depression, divorce, job loss, giving up smoking, managing weight, bullying at school, self-harming and so on. The survey we carried out in September gave us a good indication of the needs. The six most popular activities were 1. Drop in for a chat, 2. Counselling, 3. Help with accessing Health and Social care, 4. Support for teenagers and young adults, 5. Support for mothers and babies, 6. Support for carers. The use to which the Hub will be put will be determined by the community and its needs. We will be guided by the doctors who will tell us, based on the people they see in their surgery on a daily basis, what we need to be doing but also by what people in need of help are asking us to provide. Doubtless there will be specific needs across all the age groups. None of us knows better than the doctors that the Hub is needed. The kinds of suffering that the Hub will be there to address are largely invisible to us as we go about our daily lives, but they surface in the surgery when intolerable symptoms emerge. Without such a facility people, being “British with stiff upper lips”, tend to put on a brave face and suffer in silence and alone until they get ill. The Hub will help to prevent people from needlessly getting ill by signposting them to the support they need, much of it being available in the Hub. In 2019, the Community Centre will have been officially open for 25 years. The current committee recognises that work needs to be done now to modernise facilities and to improve access for all, especially youngsters and those of us who are becoming less mobile as we grow older. Also remedial or replacement work is required to improve efficiency in running the centre, e.g. lighting and a few changes to upgrade the centre to current legal requirements. The committee has a small fund built up over many years which currently supports general maintenance, however the committee will be seeking further funding opportunities to deliver the improvements we believe we need. First, however, we wanted to know your views on what you believe needs to be done, to help us prioritise and plan the work to deliver the improvements required. Feedback from the results of the survey, where possible, including proposals for the work and timescales for further comment will be posted on this website in due course. The 82 bus service has been taken over by D&G Bus. The timetable for the new service can be seen on their website here: 82 Bus Timetable. The terminus in Chester is now the new Bus Interchange, it does also now stop at Stand DD in Foregate Street. Five buses during the day go beyond the Watling Street stop in Northwich to Sainsbury’s and back. This information is on the 82 Bus Timetable. Jessica is a fully qualified dog groomer offering a mobile service around West Cheshire, Chester and Nantwich. Grooming services include nail trimming, bath using all natural shampoo, and full breed specific grooms using clippers, scissors or hand stripping. Contact: 0795 559 1188 or 01829 752525 Email: cheshiredoggrooming@hotmail.com or visit the website at: www.cheshiredoggrooming.co.uk. Due to popular demand new Physiotherapy Led Pilates classes will be starting on Wednesdays from 9th January 2019 at the Lounge, St Philips Church, Kelsall. A beginners class will be held at 6:30pm and an intermediate class at 7:30pm. This is in addition to Monday classes which are currently held in Kelsall Methodist Church. Beginners at 6:15pm and Intermediates at 7:15pm. To book your £5 taster session please contact Sarah Lloyd, Physiotherapist Bsc, MCSP, HCPC. Mobile: 07813 297757, email: sarah.lloyd-pilates@hotmail.com or Facebook/Cheshirecorepilates. All levels catered for from beginners to advanced. No previous experience of pilates required. Free GoOnLine service for Volunteers, Carers and the over 60’s continues to run in Kelsall. So if you lack confidence or just need extra help in using computers, tablets or your mobile phone and would like individual support in a friendly and relaxed environment join us. The sessions will run on alternate Tuesdays 10am to 12 mid-day on September 11th & 25th, October 9th & 23rd and November 6th & 20th. The lounge at St Philips Church has had a complete refurbishment and is now available for hire to organisations, groups, families or individuals. An ideal location and venue for meetings, coffee mornings, presentations, small family gatherings or parties, children's parties or whatever you require your ideal space for. A small but well equipped kitchen with serving hatch to main room. Kitchen is equipped with oven, microwave, kettles, crockery and cutlery. The main room has been decorated in a pleasant colour scheme and easily moveable tables and chairs mean that you can set the room to meet your needs. The Sandstone Ridge Trust would like people’s help to compile a pictorial history of the wonderful Sandstone Ridge. The Sandstone Ridge is one of Cheshire’s most distinctive landscapes, covering 230 sq kms (88 sq miles) of rolling hills and escarpments that stretch from Frodsham and Helsby in the north, through Delamere, Tarporley, Beeston, Peckforton and Bickerton, to Malpas in the south. This is rural Cheshire at its finest, linked by the Sandstone Trail. The Ridge has a long and rich history that ranges from pre-historic landscapes through the Roman, Saxon and Medieval periods to the present day. Its appearance has been shaped by centuries of farming, forestry and use of natural resources, including water sources like ancient springs and wells, as well as sandstone, sand and gravel, copper, marl and other minerals. The Trust would like to hear from anyone who has old photographs and postcards of the Sandstone Ridge area. These can be either in their original (photograph/postcard), or scanned (digital) forms. If enough images can be found, it is hoped that they could be published in a small book for everyone’s enjoyment. Kadras has kindly allowed the full text of the book 'The Story of Kelsall' by Elspeth Thomas (with illustrations by Anne Saul) to be made available on the website. The book is in a text searchable pdf format. Click the link below to have a read of this fabulous resource.